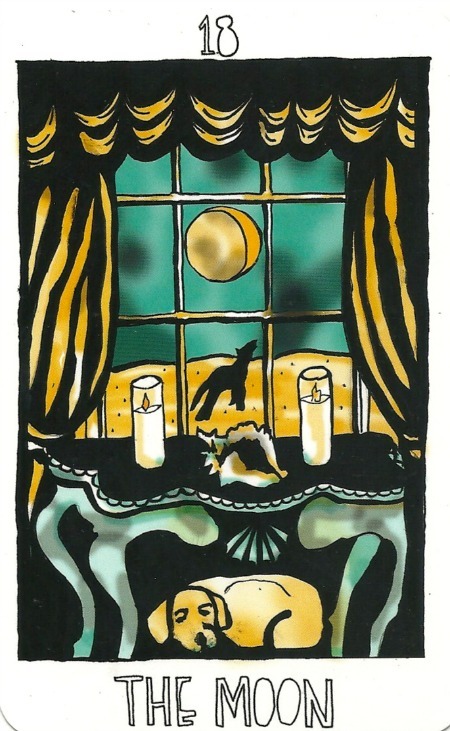 Peering into my tarot card collection this month, I realised that it had been a while since I had picked up The Collective Tarot by the Tarot Collective, and that I had been missing its all-inclusive nature. That got me thinking that maybe some of the Collective was also missing this deck. Rare is it to find a deck of cards that exists outside the white-skinned/heterosexual/gender-binary paradigm that so many decks display. So in the interest of sharing some wisdom for all the humans, I thought it was about time we called upon The Collective Tarot once again. Welcome, children, I have been waiting for you. I have a lot to share with you, so stand with me and listen closely. There is much that you will face this month, and some of the experiences you have will be so subtle that you may risk getting to the end of the month and thinking nothing much happened at all. But so much will have happened. You will need to make time to be still this month, to listen to the spaces between the words and what arises in your mind when there is silence. You will need to stop relying upon what other people think and to stop blaming them when they don’t do whatever it is that you thought they ought to do (which you probably didn’t even mention to them in the first place). Please, children, just remember to trust your intuition – there is so much in that precious tool once you love yourselves enough to trust it. And how can we know what is our intuition as compared to fantasies and fears? Go ahead then to the Four of Keys (Wands), they may be able to help you in a more obviously practical way. Helloooo Collective, the High Priestess just informed me you want some help with distinguishing your intuition from the fantasies you create in your brains, correct? Well, we Four of Keys are all about doing something only when it feels soothing to our bodies and brains. Keeping in mind of course that sometimes what is soothing may not be what we think we want. Fantasies usually have a frenetic, heady quality to them, and a deep attachment. When the fantasies remain fantasies and don’t come into reality we usually feel pretty horrible and then we so easily fall into the poor-me role, which isn’t fun for anyone. If you have a slight ever-so-sneaking suspicion that you might be kidding yourself about something (and those fantasies are usually quite loud and clangy so you’ll have to listen out carefully for the sneaky bit) then back away, let go and instead focus on activities that bring you closer to harmony. Very good. I think it is time for my entrance now Collective. The Sun! Thank you for brightening our journey. Yes, well, I’ll do my best. You seem to be heading in the general direction that will bring you benefits for now, so I will just shine upon you and encourage you along. Is there something in particular you would like to offer us, Sun? Well, now that you mention it, yes! I’m all about the embodiment of ideas. I really want to help the Collective get more creative so that their ideas can sink into their bones and their minds can sharpen. And I want to let you know that you can do all this while feeling really comfortable and nonchalant. Like the Sun in the sky, I support life, help people from afar (your love carries far, kiddos!) and know when to go to another hemisphere because the Moon is here and you all need her magic support too. ...I suppose that is my cue. Did you like the segue O Moon? Yes, my fiery friend, thank you. 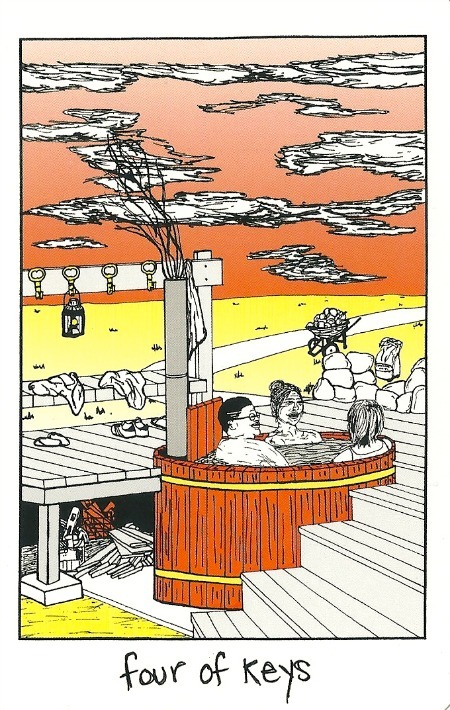 There is something about the way I am depicted in this tarot deck that makes me feel so relaxed and inspired. I think I might talk about my manifestation capabilities today, Collective. It is important to know about my potential to awaken things that need to be visible. So many people get lost in sensationalist news that they cease to realise how spiritually bankrupt they have become. With the Moon in town, it becomes harder to ignore that nagging suspicion that there is something more important going on. That perhaps getting caught up in these battles of right and wrong is stopping us from experiencing a way of existing that surpasses judgemental thought and is thoroughly engaging and healing. I wish more of the Collective would spend some time with me. I mean, I do these lunar eclipses every now and then to get you out of your homes, out in nature and gazing upon my face, but really, I am with you always. Gently encouraging you to return to your breath, observe within and speak from a wise place that allows you to manifest a world that has more room for love and connection than ever before. As for me, I am of the more solid and practical kind. 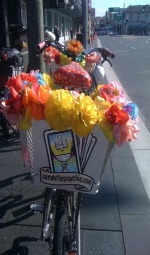 Available to you whenever you want to figure out ways of taking on big tasks in a more manageable and creative way. Ace of Bones (Pentacles), thank you for joining us. It is my pleasure. 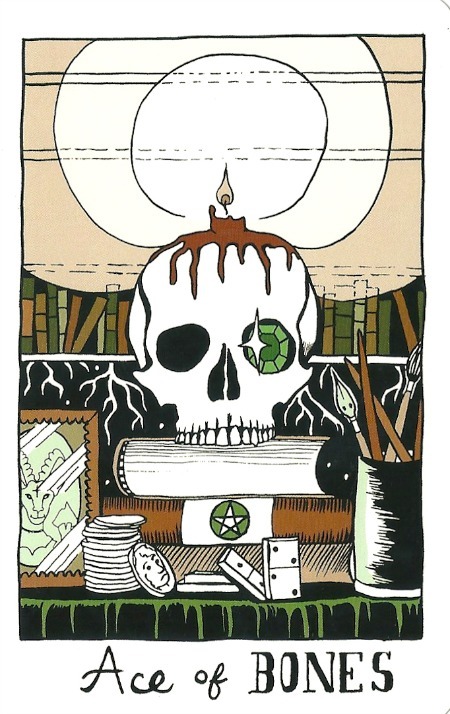 And I must say I am really enjoying being a skull in this tarot deck. With a candle dripping away on my head. With a gem in my empty eye cavity. This is rather marvellous. No one can deny that I am here, and here to whip you all into shape as you are reminded of your own mortality while experiencing an overwhelming urge to just get up and do things. The things that you are born to do. Those things that some may tell you are a waste of your time and abilities, but really what do they know? Nothing, that’s what! Well, to be fair, perhaps they know about some things but they certainly don’t know about you and all your amazing ideas and potential and deep-felt understanding that you appeared on this Earth to do more than just blindly follow the lead of other blind beings. It is my pleasure to help you all stay strong and grounded as you start to build your stamina and get the best of your offerings out into the world before you have time to regret yet another missed opportunity. And now I believe it is time the Collective was introduced to me. 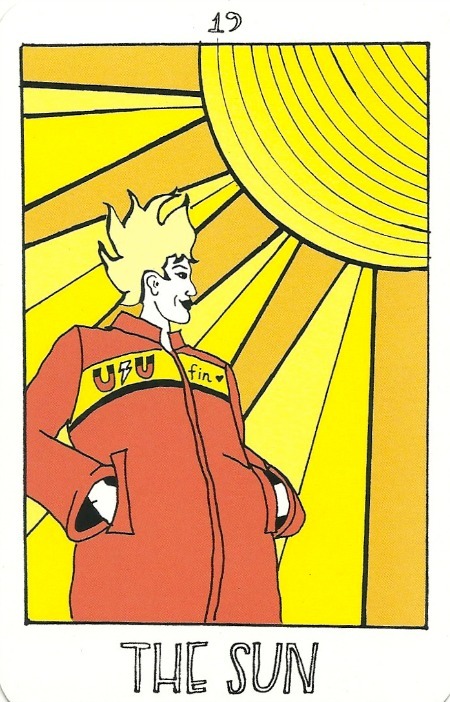 Liberation (Judgment), yes, we are so glad you are here. And how differently you stand before us today! Yes, I was feeling so misunderstood in my usual depiction as an angel in clouds with a horn. And with the naked humans below me, beckoning in an incomprehensible way. Things are so much clearer now. I am taking off the mask, and being who I truly am meant to be. And is this how you are helping us this month Liberation? By helping us be ourselves? Yes, yes I can certainly help with that. I will also help you just let go of all the worries of what other people think about you. Instead of constraining yourselves by trying to fit into others’ conditioned ideals, you can just lie back and enjoy the splendour of living. And by living I mean simply doing what you wish to do, as long as you are harming no one. And don’t let those pesky naysayers tell you that your existence is harmful to their ideologies. They just mean to say that they haven’t figured out how to live yet – that they didn’t know they were allowed to try something real and authentic to them. So really, just let me remind you to stand up more often to exist in a way that brings you peace. And somewhere in there, try and trust that eventually more people will stand beside you. And in the meantime, you always have your own heart. Farewell for now! 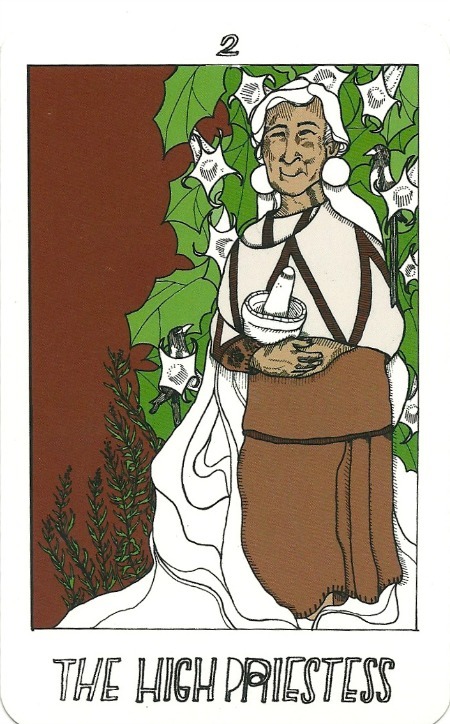 This Tarot Reading for the Collective was done with The Collective Tarot, by the Tarot Collective (!) 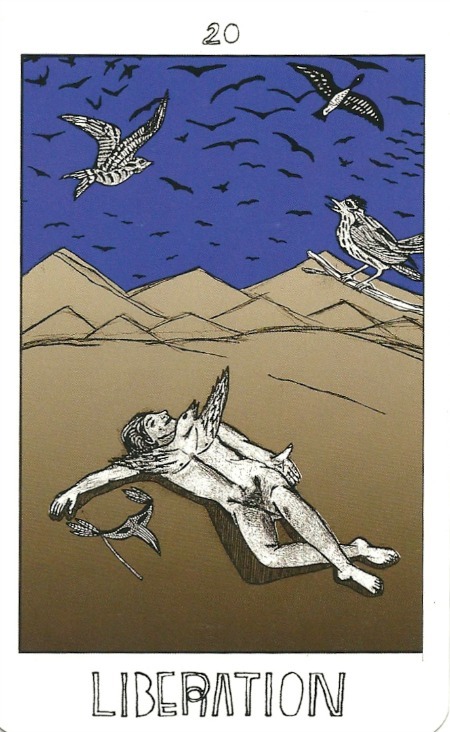 © 2012, Printed at Brown Printing, Portland, Oregon, U.S.A) Click here for more information about this wonderful, inclusive tarot deck.